The methods of measuring liquid depend on the use of the liquid. There are different methods for kitchen, industrial and scientific use. That is because the resulting measure of liquid differs. For instance, a tablespoon for measuring liquid in a kitchen would not be appropriate for measuring barrels of oil. A burette is a tool, typically used in labs, that measures liquid volume. It is similar to a graduated cylinder in that it is a tube with an opening on the top and graduated measurements on the side. The differences are that a burette stays in place with a clamp and has a tap near the bottom that allows liquid to drip out of an opening at the bottom of the tube. A common use for the burette is titration. The bottom opening of the burette goes over a liquid-filled flask. The burette allows its liquid to mix slowly with the liquid in the flask for titration. A measuring cup is a kitchen tool. It has graduated measurements on the side, often in U.S. and metric measurements. It is for measuring larger amounts of liquids and solids for recipes. Measuring spoons are for smaller liquid measurements. They measure fractions and wholes of teaspoons and tablespoons. A graduated cylinder is a glass or plastic cylinder with a round base. There are graduated markings on the side. 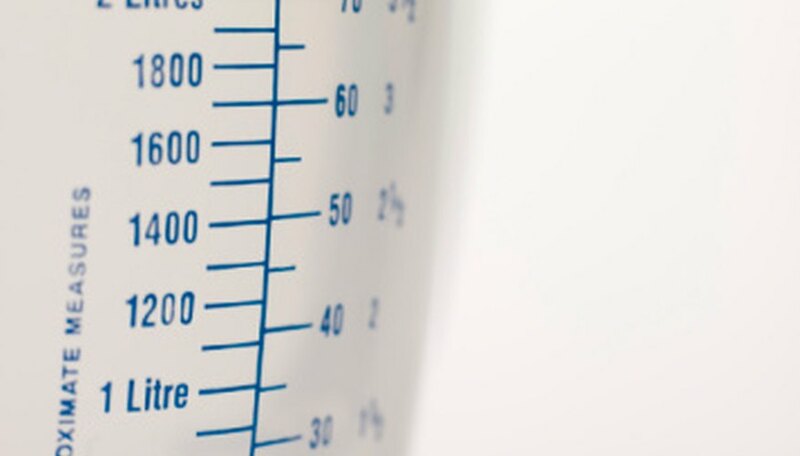 A graduated cylinder typically takes measurements by milliliter. A syringe is a measuring device with a needle and a manual pump. It is for administering intravenous medicine. The liquid medicine goes into a plastic tube with graduated measurements on the side. The needle is on one end of the syringe. The pump is on the other. Pushing down on the pump causes the liquid to exit through the needle. Adversely, pulling on the pump when it is already depressed will pull liquid into the tube through the needle. A pipette is a dropper for measuring small amounts of liquid, consisting of a glass tube attached to a bulb. When the bulb is depressed and then expands, it draws liquid into the tube. A pipette is typically for lab use. A volumetric flask is a liquid measuring device that has the shape of a vase with a slender neck. The user can place different liquids into the flask and use a stopper to plug the top hole. This allows the user to shake the flask, mixing the liquid inside. Barclay, Shelly. "Types of Liquid Measuring Devices." Sciencing, https://sciencing.com/types-liquid-measuring-devices-8469307.html. 24 April 2017.